• The study examines the prime supply-side factors, which affect the growth of the market, along with the current and future trends, market drivers, restraints, and challenges prevalent in the global radiation hardened electronics market. • A detailed market share analysis, which focuses on the ¬key market developments and strategies, followed by the top players in the market, has been included in this report. Additionally, the report includes competitive benchmarking of the players in the global radiation hardened electronics market. • This report identifies the global radiation hardened electronics market under different segments such as component types, manufacturing techniques, end users, and region. 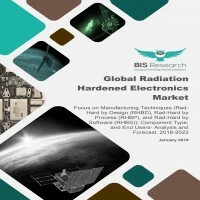 • The global radiation hardened electronics market for the major regions, including North America, Europe, Asia-Pacific, and Latin America, Middle East, and Africa, has been analyzed in the report. • In the company profiles section, the study provides a detailed analysis of 15 key players in the global radiation hardened electronics market, namely, Analog Devices Inc., BAE Systems, Cobham plc, Data Device Corporation, Honeywell International, IBM, Infineon Technologies, Microchip Technology, Micropac Industries, Renesas Electronic Corporation, Solid State Devices, STMicroelectronics, Texas Instruments, Inc., The Boeing Company, and Xilinx. This section covers their business financials, company snapshots, key products and services, major developments, and the individual SWOT analysis. The preceding figure illustrates the increasing revenue generation of the global radiation hardened electronics market over the years. The market reported revenue of $1.45 billion in 2018 and is expected to grow at a significant CAGR, during the forecast period 2018-2023. The global radiation hardened electronics market has been segmented into nine-component types: microprocessors and controllers, sensors, application-specific integrated circuit, field-programmable gate array, memory, power sources, discrete semiconductors, analog and mixed signals, and others. The microprocessors and controllers component type market acquired the largest share in 2017. However, application-specific integrated circuit market is expected to grow at the highest CAGR during the forecast period, 2018-2023.